Turkish police have pulled out of Istanbul’s Taksim Square which has become the focus of the largest anti-government protest in years. PM Recep Tayyip Erdogan has said police may have used excessive force but that the park development will go ahead. Earlier on Saturday, he called for an end to the protests, saying Taksim Square “cannot be an area where extremists are running wild”. In a defiant speech to the exporters’ union, Recep Tayyip Erdogan insisted plans to reconstruct an Ottoman era military barracks on the Gezi Park site would go ahead and that a shopping mall “might be built on the ground floor or a city museum”. Correspondents say that what was initially a local issue has spiraled into widespread anti-government unrest and anger over the perceived “Islamisation” of Turkey. Another, Oral Goktas, said the protest had brought together people from many different backgrounds. The perception that police had been heavy-handed by firing tear gas and water cannon – a view adopted by many of the country’s mainstream media – also fuelled the unrest. Dozens of people have been injured in the clashes. Recep Tayyip Erdogan said there had been “some mistakes, extremism in police response”, while the authorities have insisted that any allegations of abuse of power by the police will be investigated. The scene in the central square appeared to be peaceful, with protesters chanting slogans, dancing and waving banners, some calling for the government to resign. 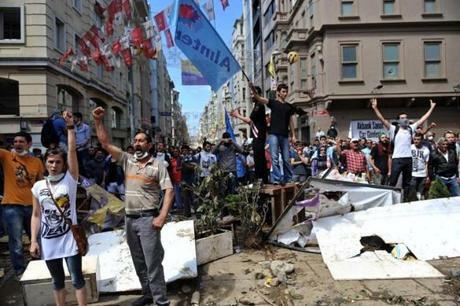 However clashes continued in the Besiktas district of the city to the east. Police were using tear gas and water cannon to hold back protesters near the Shangri-la hotel. Recep Tayyip Erdogan has been in power since 2002 and some in Turkey have complained that his government is becoming increasingly authoritarian. In his speech, Recep Tayyip Erdogan criticized the “preaching” of foreign governments, saying they “should first look at their own countries”.